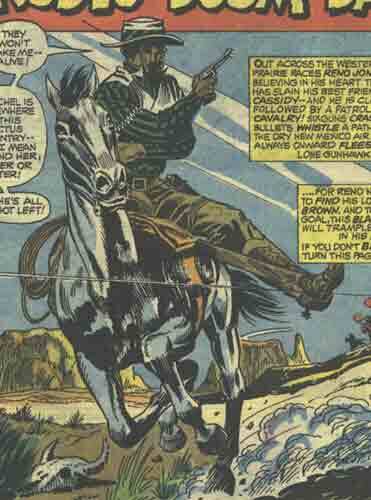 Powers/Abilities: Reno Jones was a skilled horse rider, and could win at rodeos with his skills. He was also an expert gunfighter with pistols and rifles, but usually wielded a buffalo gun during his search for Rachel Brown. The buffalo gun had a powerful kick, but could shoot further than any other conventional weapon of the time. 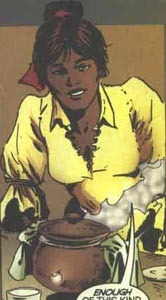 History: (Gunhawks#1 (fb)/Blaze of Glory#1 (fb)) - Reno Jones was the son of a cook employed on a plantation in Georgia, and he befriended the master's son Richard Cassidy when they were both children, although Cassidy came to think of Reno as less of a friend as they grew older. When the Civil War broke out, Reno refused to take up arms, feeling that no matter which side he fought for would set him against his people, and instead remained at the plantation. However, the war eventually reached the plantation, and Union soldiers killed Mr. Cassidy and took Reno's lover, Rachel. Reno was furious, and joined the Confederacy to have revenge. When the war finally ended he returned to the plantation where he found Richard Cassidy. He told him what had happened to Rachel, and they decided to ride together and find her. (Gunhawks#1) - After a year of fruitless searching in the west, Reno and Cassidy decided to take up buffalo hunting to earn money. They were befriended by Jed, an expert buffalo hunter, and they told their story to him. Jed took Reno under his wing and taught him how to fire a buffalo gun of his own design, and after six weeks of practice, Reno could hit a target from a mile away. When the Dawson Gang attacked Jed's herd, Reno and Cassidy helped fight them off, and Reno shot Dawson himself dead with the buffalo gun. While examining Dawson's body, they found a locket around his neck of Rachel, and decided to chase the rest of the gang to find out what they knew about her. Jed let Reno keep the buffalo gun. (Gunhawks#2) - Reno and Cassidy caught up to the last gang member, and learned that Dawson had sold Rachel to a plantation near River City. Cassidy schemed to get them inside the plantation by turning Reno in to the jail at River City, claiming he was a murderer. After Cassidy learned how Colonel Johnson's plantation was paying for black people to use as slaves, he pretended to join up, and broke Reno out of prison so that he could be brought to the plantation. There, Reno led the slaves in an uprising against the plantation staff, and the Colonel was ultimately killed. Cassidy learned that Rachel had been taken in an indian raid. The slaves wanted Reno to stay and lead them, but he had to continue his search. (Gunhawks#3) - As Reno and Cassidy were travelling to the Cheyenne village at Medicine Creek, they were set upon by Captain Warren Worth of the U.S. Cavalry, who was on his was to exterminate the village. He took them both prisoner under suspicion of selling rifles to the Cheyenne. When the cavalry descended upon the village to massacre it, Reno broke free to try and warn the people, but the cavalry caught up to him. After wiping out the village, they brought Reno and the surviving Cheyenne to Fort Mitchell to be jailed. In jail, Reno learned from the Cheyenne that Rachel had been living in the village, but was likely killed during the massacre. (Gunhawks#4) - Captain Worth set Reno free on the condition that he left the territory immediately, but Reno set out to find Cassidy, who had fallen into the clutches of the Cheyenne warrior Grey Fox. Jones was captured by a Cheyenne scouting party and brought to Grey Fox's camp, where he saw Cassidy in a pen, pitted against a grizzly bear. Reno leaped into the pen to save Cassidy, and slew the grizzly with a knife, even though his hands were tied. (Gunhawks#5) - Before Grey Fox could deal with Reno, his gun runner Reverend Graves appeared, and asked Grey Fox to turn Reno over to him to help him build a new church. Grey Fox did so, and Reno was forced to ride aboard Graves' wagon. Along the way, he witnessed Graves meeting with the U.S. Cavalry, who he directed to Grey Fox's camp, intending them to wipe each other out. Jones managed to overpower Graves and took a horse back to the camp, where he warned Grey Fox just in time. He then ran into Cassidy, still weary after the trials Grey Fox had put him through, and got him to a horse, when Reverend Graves appeared again. When Graves took a shot at Reno, Cassidy fired back and killed him. As he died, Graves revealed that he had hoped he and Reno could have been friends, and Reno gave him a proper burial. Returning to the camp, they found the cavalry victorious, but Reno was shocked to see Grey Fox riding away with Rachel. Reno was about to set after them, when Cassidy struck him from behind, knowing that Rachel wanted things this way. (Gunhawks#6) - Reno was furious when he came to, and drew on Cassidy. He fired off a wild shot, not wanting to hurt his friend, but at the same time, a rifle shot from Grey Fox killed Cassidy by mistake, and Reno thought he had done it. Captain Worth accused Reno of Cassidy's murder, and Reno was forced to go on the run. He managed to double back to try and bury Cassidy, but Grey Fox ambushed him, attempting to kill him so that Rachel would forget about him, but Reno slew Grey Fox in battle, unfortunately before he could learn where Rachel was. Now wanted for murder, there was nothing for Reno to do but ride. (Gunhawk#7 (fb)) - Needing fresh clothes, Reno had a card game with a white man, and wound up winning the man's outfit. He continued to be pursued by the U.S. Cavalry. (Gunhawk#7) - Reno saved a wagon of women from indian raiders, unaware that Rachel was one of the women onboard. Later, he discovered an outlaw post office, with an advertisement for a rodeo in Cayuse, New Mexico. Needing the money, Reno rode to Cayuse, and pretended to be simple-minded so that they would let him compete. Reno wound up winning the bronc busting, which made him an enemy of San Francisco Slade, a local rodeo expert. He sent a couple of men to rough Reno up, but Reno beat them both. The next day, Reno set a new world record for 12 seconds on steer wrestling, and Slade hired a man named Durango to kill him. Durango called Reno a coward to make him draw, but Reno wound up shooting him first. Slade then claimed Reno had shot him in cold blood, and Reno was sent to jail. Slade then claimed all of Reno's money when he was disqualified. He came to boast to Reno in jail, and Reno punched him through the bars. As he sat in his cell, Reno looked out his window and saw Rachel in a wagon just leaving town, and realized that he had just missed her again. (Blaze of Glory#1 (fb) - BTS) - At some point in his travels, Reno met the Rawhide Kid. Reno eventually settled down to Wonderment, Montana, and took a woman named Mary as his wife, and they had a son named Cass. (Blaze of Glory#1) - When a band of Nightriders descended upon Wonderment to drive the locals out, Reno took up arms against them, but they were powerful for one man. At a town meeting, it was decided that Reno and Marcel Fournier would set out to find help. Reno tried the local army first, but they refused to help. He then traveled to Buffalo Bill Cody's Wild West Show, where he found the Rawhide Kid and Kid Colt, and the two men agreed to help. (Blaze of Glory#2) - Fournier attempted to recruit the Two-Gun Kid in Anaconda, Montana, but was turned down. They met up with the Outlaw Kid while there, but were confronted by Caleb Hammer, a Pinkerton agent pursuing Kid Colt. Colt killed two of Hammer's men, and they had to ride out early. While camping for the night, they met up with the Two-Gun Kid, who had changed his mind. Fournier led the heroes back to Wonderment through a secret passage over a river, but it was an ambush for the Nightriders, who hit Reno as he crossed the bridge, knocking him into the river below. (Blaze of Glory#4 (fb) - BTS) - Red Wolf saved Reno from the river, and brought him to Flaming Star, who provided Reno with the Ghost Rider costume so that he could employ it against the Nightriders. (Blaze of Glory#3) - Reno, armed with his old buffalo gun, appeared before the Nightriders as the Ghost Rider, and scattered their camp, allowing their two captives Gunhawk and Caleb Hammer to escape. (Blaze of Glory#4) - As the Nightriders made their final run on Wonderment, Reno rode against them as the Ghost Rider, and killed Clay Riley, the man employing the Nightriders. He was hit by the Nightriders' leader, who he recognized as Kid Cassidy. Before Cassidy could finish him off, the Outlaw Kid set off an explosion, and Jones strangled Cassidy to death. In the aftermath of the carnage, Cass asked Reno if he would keep the Ghost Rider costume, but Reno replied, "Ghost Rider died today. Let him lie in peace. Let me live the same way." Reno saw off the Rawhide Kid as he left Wonderment with Caleb Hammer, the rest of their allies having been slain in the battle and buried at Wonderment. (Apache Skies#4 - BTS) - After aiding the Apache Kid and Eustace Grimes in rescuing a number of Apache children, the Rawhide Kid suggested that they bring the children to Wonderment, and to look up Reno. Comments: Created by Gary Friedrich, Syd Shores and Sol Brodsky. 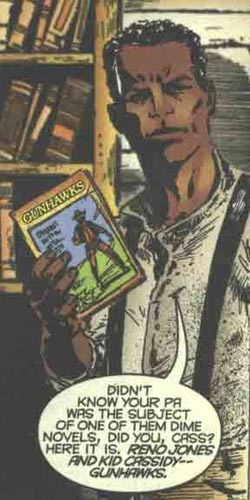 The end of Gunhawk#7 promised that Reno Jones' story would be picked up in Western Team-Up, alongside the Rawhide Kid. However, Western Team-Up only had one issue (Rawhide Kid + Dakota Kid), and Reno wasn't in it. Blaze of Glory and Gunhawks offer two different versions of the characters' origins. 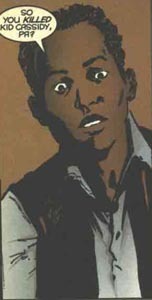 According to Gunhawks#1, Cassidy and Jones were friends, Jones wasn't a slave, Jones eventually fought in the Civil War, and the two rode as comrades after the war. Blaze of Glory asserts that much of this was fabricated by dime novels, and that Jones was a slave, and that he and Cassidy were only really friends when they were children. It also altered the circumstances of Cassidy's death somewhat, depicting it as occurring in a saloon instead of the Native village. Now, this would seem to place Gunhawks out-of-continuity, buuut...well, Jones and Cassidy wouldn't have much history to cover then, would they? I've included the series in both of their bios, and made the conflicting accounts match as best as I could. It's best to believe that while the events of Gunhawks#1-7 may be the "dime novel" version, there's at least some truth in there that applies to the post-Blaze of Glory retconned Reno and Cassidy. The American Civil War ended in 1865, and Gunhawks#1 opened one year later, so the events of the Gunhawks series would be set in 1866-1867. A Space Phantom impersonated Reno Jones in Avengers Forever#5. Note that the Ghost Rider of the Old West is usually referred as "Phantom Rider" to help avoid confusion with the Spirit of Vengeance Ghost Riders. Mary Jones was Reno's wife, and mother of his son Cass. Cass Jones was the son of Reno and Mary Jones. He was in awe of his father's history as a gunfighter, and that his father knew so many famous outlaws. When his father was seemingly killed by the Nightriders he asked Kid Colt to teach him how to use a gun, but Colt refused, not wanting Cass to wind up like him. All other characters mentioned or pictured are ™ and � 1941-2099 Marvel Characters, Inc. All Rights Reserved. If you like this stuff, you should check out the real thing!